Jet Charter Europe is your source for the best deals on empty leg flights in the UK, France, Germany, Italy, and across all areas of Europe! Our brokers have direct access to all of the charter planes available for your flight to offer the best deal every time you fly! Enjoy instant access to transient planes in major cities such as Paris, Rome, Nice, Geneva, and London, ideal for business within the EU, or transatlantic flights to the United States, Canada, or the Caribbean. We can also find great deals on pistons and turboprops for travelers connecting their commercial flights with private air charters to Ibiza, Mallorca, Cyprus, Sicily, Malta, Porto Cervo, Santorini, or anywhere in the Mediterranean. Give us a call at +1 (888) 987-5387 and tell our brokers you’re searching for an empty leg deal in Europe. 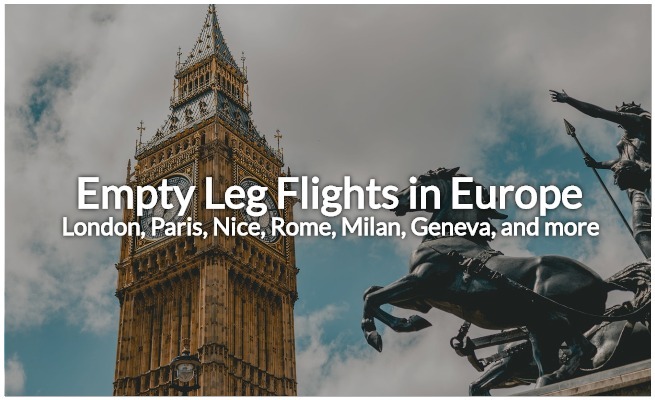 Let us find match the routing of your trip with empty legs near you, and save 20%, 30%, up to 50% or more on the cost of private jet charters in Europe! Every now and then, private planes need to reposition to another airport, and when they do, they’re scheduled to fly without any passengers on board. These flights are referred to as empty legs, and can also go by “deadhead legs”. This most often happens after one-way charter flights, or when aircraft owners use their planes, and the aircraft needs to return to its home airport. In the case of one-way flights, the cost of the return/re-positioning leg is typically included in the quote. Since the return portion of the trip is already paid for, charter operators discount and market the flight. For example: a client in New York City books a one-way flight to London. After the plane arrives in the UK, it must fly back to Teterboro Airport where the plane is based. Once it’s made available, anyone in the United Kingdom can get an amazing price on a charter flight to NYC! So, what’s the catch? Although empty legs are created every day, they can be pretty hard to find if you don’t know where to look. You can call operators or visit their websites, but you’re limited to the charter planes within their fleet. How do you get a hold of one of these time-sensitive specials? And how do you know you’re getting the best deal on your flight? Jet Charter Europe specializes in private aviation around the globe, arranging charter flights in all areas of Europe. Give us your trip details, and let us search the charter market for a transient plane: our brokers have access to all the planes available for your flight, searching through more than 15,000 planes to match you with the best deal! Being flexible with the dates & times of your trip opens up more aircraft options for your flight. Planning on chartering a one-way flight to/from Europe? Provide us with advanced notice of your preferred dates! If an empty plane is available, you can cut the cost of your private charter flight! You can also gain peace of mind knowing that no matter how much a flight is reduced, we never cut costs by sacrificing safety, quality, or comfort to offer amazing rates on empty leg specials in Europe! Our brokers are available 24 hours a day to arrange private air charter services in Europe. Getting a charter quote from us is free, so make sure you request an empty leg quote so you don’t miss out on the best deals on air charters in Europe!